The Directors Rights Collective of Canada is an organization that collects residuals that accrue from foreign screenings of Canadian film and television. I've received several hundred dollars for work I directed on Monster By Mistake. The DRCC has money they have not been able to distribute as they cannot locate the directors. The list is below. Click on the images to enlarge. 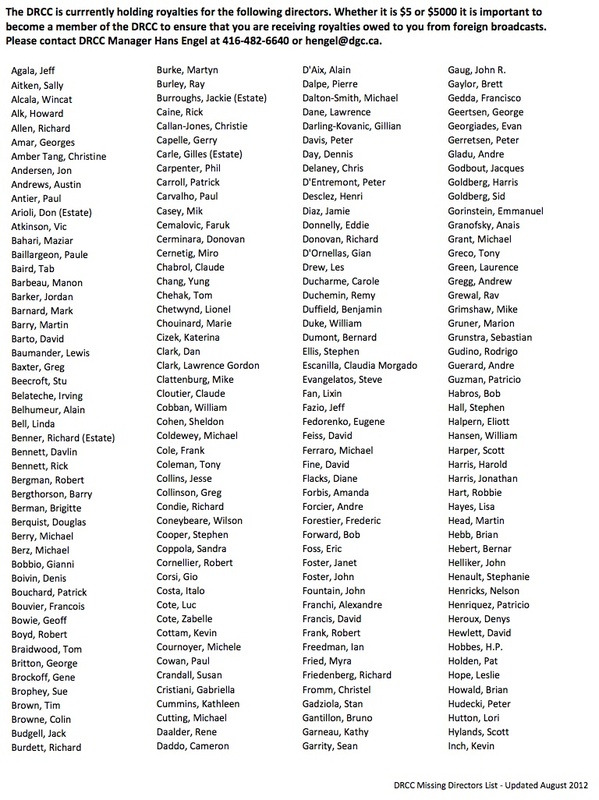 I see the names of several animation directors from the NFB on the list as well as animation directors of TV series. If you're on the list or know someone who is, contact the DRCC. For the record, I have alerted Kaj Pindal, whose name is on the list. The Directors Rights Collective of Canada (DRCC) is currently holding royalties for the attached list of directors derived from foreign broadcasts of their work. We have been unable to make contact with them in order to send them these funds. The attached list is comprehensive and includes directors for whom we are holding very little funds, to those for whom we are holding a substantial amount. The list includes estates for those directors who have passed as well as those for whom we believe we have contact information but have not responded. It is also possible that due to the small amount of royalties owing, we have not yet made efforts to contact them. It is important for all audiovisual directors to be members of the DRCC, regardless of whether a director's work has received foreign broadcasts or not, and whether or not any royalties are currently owing. Membership ensures that they and their works are registered with us and the centralized collecting society database in Europe allowing for identification and subsequent distribution of royalties. Membership to the DRCC is free with the proviso that once sufficient royalties are collected, a one-time $50 fee is deducted from those royalties. The membership form is also attached and can be submitted via email, fax or regular mail. The DRCC has over 900 director members, working in all genres, living in Canada and abroad. The DRCC has agreements with 24 foreign collecting societies in Europe and Latin America. In 2012 alone the DRCC will distribute more than $620,000 worth of royalties to its membership. It pays to have rights. We would appreciate any help you can provide in tracking down these directors so that we can be sure to pay out what is owing to them currently as well as any future royalties collected. 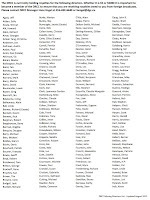 Please have a look at the list and let us know of any contact information you may have. 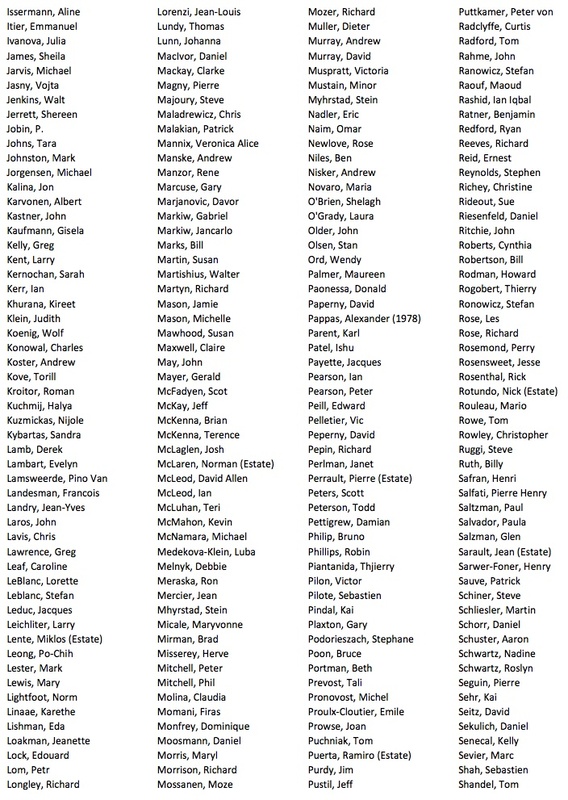 Also, feel free to pass the list on to others who may know or who may themselves be on the list. Any help is greatly appreciated. Also, if you are receiving royalties from the Directors Guild of America (DGA) but are not a member of the DGA nor a resident of the USA, please contact us as there may be avoidable deductions to your payments taking place. 1,000th Post: Where's Our Eastwood? Since May, 2006, I have now posted 1000 times to this blog. It's hard to believe. I'd be the first to admit that the quality of the postings is variable. There are some that are simply announcements or were tossed off quickly just to keep the blog from going stale. However, there are entries I'm proud of, even if they're becoming fewer and farther between. I once asked on this blog, "Where's our Brando?" That discussion was about how characters in animation are conceived and executed. I'm now going to ask, "Where's our Clint Eastwood?" 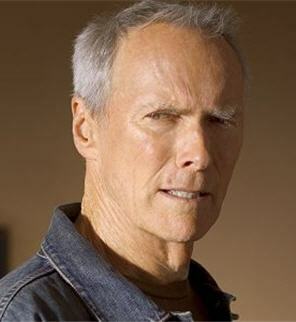 I mistakenly wrote Eastwood off years ago during his Dirty Harry period. I had no interest in movies about right wing vigilantes. This summer, I have watched a large number of films that Eastwood directed, and I have to say that I was very impressed and embarrassed by my earlier response to him. What does Eastwood have to do with animation? Unfortunately, nothing. However, Eastwood's strengths as a director point out the shortcomings of animation directors currently working. Eastwood is tremendously eclectic. He moves between genres but even within genres he's not afraid to take different approaches. The same director made a mid-western romance, The Bridges of Madison County, and a war movie from the Japanese perspective, Letters from Iwo Jima. He's made films set in working class Massachusetts (Mystic River), in post-apartheid South Africa (Invictus), in the boxing world (Million Dollar Baby), in 1920s Los Angeles (Changeling), Savannah (Midnight in the Garden of Good and Evil) and the old west (Unforgiven). His film's characters have been country and western singers (Honkytonk Man), jet pilots (Space Cowboys), retired auto workers (Gran Torino), transvestites (Midnight in the Garden of Good and Evil), escaped criminals (A Perfect World), over-hyped war heroes (Flags of our Fathers), film directors (White Hunter, Black Heart) and reluctant psychics (Hereafter). The range of Eastwood's films and the characters in them is immensely broad and he's sympathetic to characters from all walks of life and in all kinds of circumstances. While live action films can be made faster than animated features and Eastwood may be an exception even in the live action world, there is nobody directing animated features who comes close to Eastwood's range. He does have the advantage of not having to include children in his audience, even though children sometimes feature prominently in the films. In Hereafter, a young twin has to deal with the death of his brother. In Honkytonk Man, a young boy has to watch his uncle made poor choices and succumb to disease. In A Perfect World, a kidnap victim comes to have feelings for his captor, who seems to understand him better than his own family. Because Eastwood doesn't have to simplify his films to satisfy children, his characters are free to exist ambiguously, having to make choices that are not clearly good or bad, but simply the best they can do under the circumstances. And the endings are free to be downbeat if that's what the story demands. There's something else interesting. Eastwood isn't a writer. While I am an auteurist from way back, and while I applaud the existence of personal films in animation and live action, Eastwood's approach is to find a script that he finds interesting, rather than create or shape the material from scratch. I think this input from other minds gives Eastwood something to wrestle with, rather than letting him fall into familiar patterns. 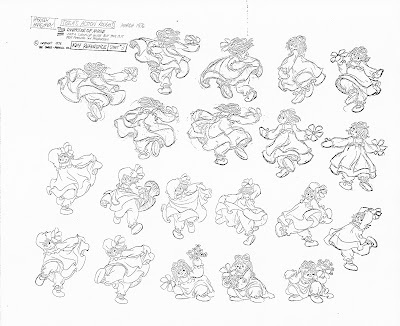 In animation these days, even if the director hasn't originated the story, the story department is likely made up of people with the same frame of reference as the director. That, plus the economic pressure to hit the family audience and gross hundreds of millions of dollars, reduces animated features to a very narrow area. There are animated features that have broken the mold, but they tend to come from other cultures: Persepolis (Iran and France), Spirited Away (Japan), Mary and Max (Australia), The Secret of Kells (Ireland) and The Illusionist (France and Scotland). It's wonderful that these films were made and that we've gotten to see them in North America, but it's frustrating that North America is not capable of significant variety in animated features. I have to admit that live action films and graphic novels hold more interest for me these days, due to their variety of subject matter and point of view, than animated features. Currently, animated features are successful at the box office, so there is no incentive for anyone to rock the boat. Hollywood is famous for riding trends until they die, so until animated features consistently tank at the box office, I don't expect to see a change. However, while the medium may be advancing technically, it is pretty stagnant in other ways and that's a shame. I wonder if we'll ever reach a point where animation has a Brando directed by an Eastwood? Animation festivals are proliferating in Ontario these days. In addition to the Ottawa International Animation Festival and TAAFI, there is now an animation festival in Burlington, located down the Queen Elizabeth Way from Toronto. The Burlington Animation Festival will take place on Saturday, September 29. The inaugural festival is starting out very modestly, with a single screening at the Encore Upper Canada Place Cinemas located at 460 Brant Street in Burlington, ON. A list of the films to be screened can be found here and tickets can be purchased here. The festival also has a Facebook page and is on Twitter. 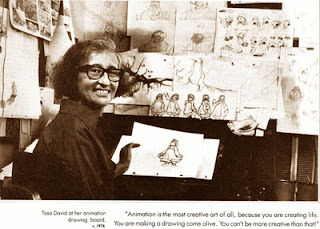 Animator Tissa David has died at the age of 91. Michael Sporn has more at his site. Michael was associated with Tissa professional and personally for more than 35 years. Tissa drew exquisitely well. 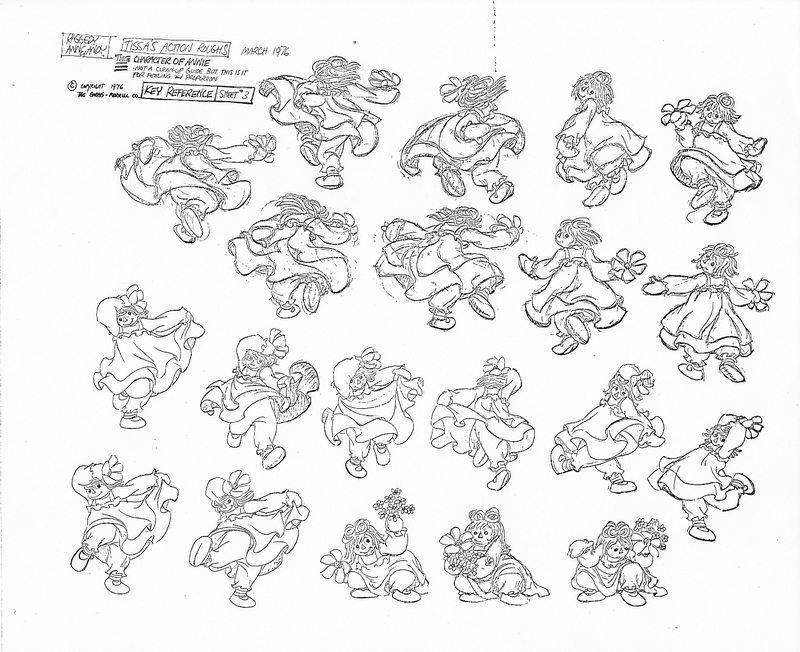 Her animation was very sensitive but could also be vigorous and raucous. After working in Europe and coming to the U.S. after the second world war, she worked with Grim Natwick for years. 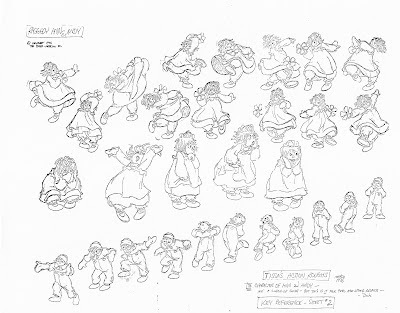 She animated for John Hubley, R.O. 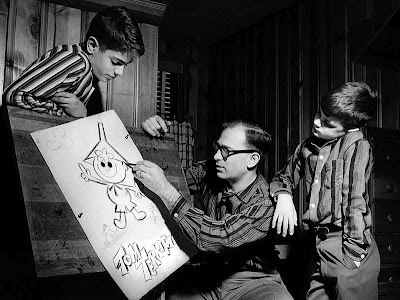 Blechman, Richard Williams and Michael Sporn. She animated the whole of Sporn's TV special The Marzipan Pig. Because she was located in New York, she didn't get to work on projects that had the visibility of features made in California. It's unfortunate that her name isn't associated with the kinds of animation projects that an average person would be familiar with. However, she was unquestionably one of the best animators the field has ever seen. 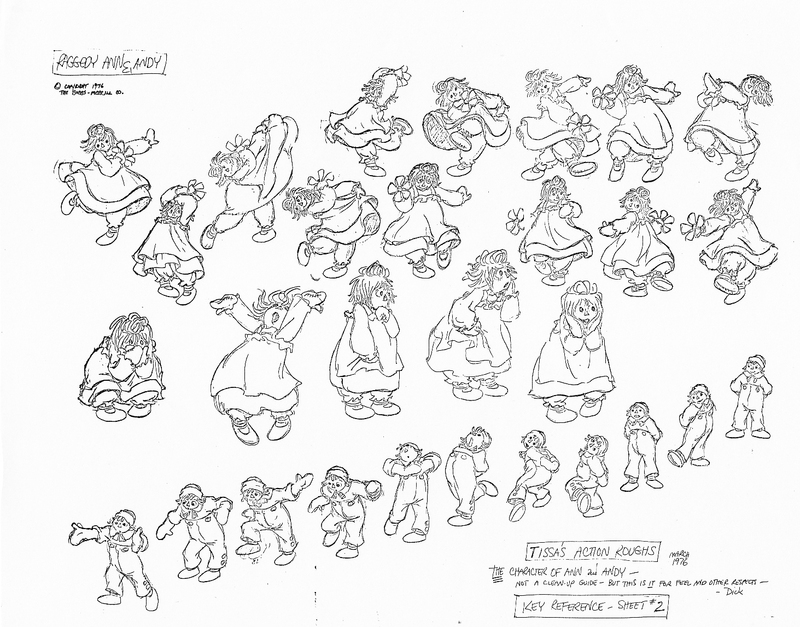 Tissa's roughs from the 1977 feature Raggedy Ann and Andy. She was a fixture of the New York industry for over 50 years and her loss is a blow to the animation community and certainly to her friends and co-workers. 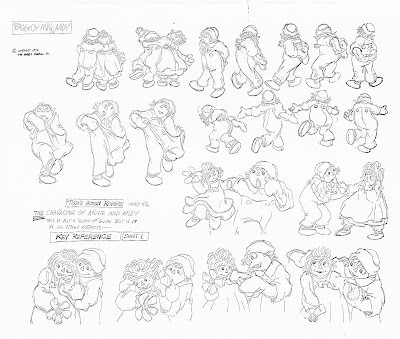 Below is John and Faith Hubley's Cockaboody, animated entirely by Tissa. 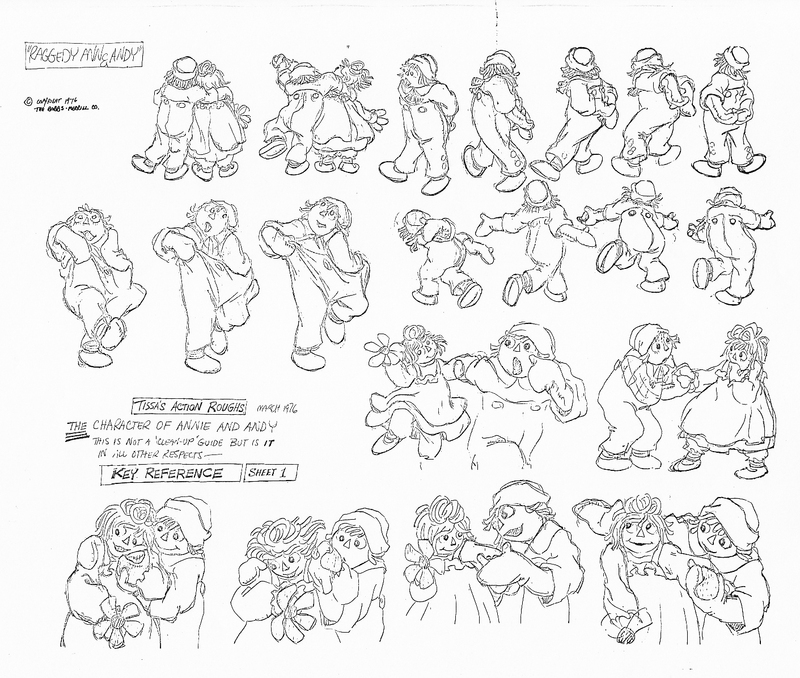 Update: Canadian Animation Resources has links to stories with more information. This may only be of interest to those working in the Canadian animated TV field, but DHX has bought Cookie Jar. While consolidation makes it easier for the two studios to compete internationally, it also makes it harder for independent producers to get their work on Canadian TV. Michael Hirsh, CEO of Cookie Jar, was one of the founders of Nelvana. Cookie Jar rose out of the ashes of Cinar, a Montreal company that was plagued by scandals over fraud with regard to government tax credits and suffered from the untimely death of co-owner Micheline Charest. Hirsh reorganized Cinar into Cookie Jar and bought DIC in 2008. There was speculation from the beginning that he intended to take the company public. While that hasn't happened, there's still a large payday for Cookie Jar's owners. DHX is the result of the 2006 merger of Decode and the Halifax Film Company. The merged entity later went on to purchase Vancouver's Studio B in 2007. Whether this means that Michael Hirsh is retiring or will take a position with DHX is unknown at this time. Several recent events have reminded me of the risks involved in animation. Brenda Chapman's dismissal as director of Pixar's Brave is old news, but she recently spoke out about being fired. Henry Selick's untitled film with Disney was cancelled, forcing the layoff of over a hundred artists at the Cinderbiter studio in the San Francisco area. Finally, and this won't be as well known, the CEO of the Go Go Gorillas operation, Christopher Turner, is under investigation for fraud. Further details here. I've written about John Celestri in the past. John's a friend and former co-worker who was looking for an alternate financial model for animation and connected with Christopher Turner. The company was attempting to use a restaurant/arcade to fund animation. That's the reverse of the typical approach where popular cartoon characters are used to brand other enterprises like theme parks. In any case, it is doubtful that the company will be able to move forward or survive with this shadow hanging over it. The important thing to realize is that risk is unavoidable and the above events are not the result of malice. While the people who have been affected by this will suffer, there was no intent for that to be the case. Pixar would have been better off not hiring Chapman rather than deal with the public relations problems of taking her off the film. Disney expected to release Selick's film or it wouldn't have bothered to invest in it to begin with. Time will tell if Christopher Turner was a businessman who got in over his head or whether he deliberately planned to defraud, but there are much quieter ways to steal money. Ask Bernie Madoff. There's no shortage of studios that have lost projects in mid-production or been forced into bankruptcy by creditors. The artists at those studios have fallen victim to forces beyond their control. If Chapman and Selick, who were working for the largest animation company in the world, couldn't avoid risk, no one can. That's the moral. No matter how solid things look, they never really are. It pays to plan for losing your job. Can you survive financially if you're laid off? Are you in touch with enough people in the industry to find your next job? Are your skills up to date so that you can easily fit into another production? If the answer to any of the above questions is "no," then you're more vulnerable to risk than you should be. 348,000 people in the U.S. cancelled their cable in three months time. Why? This article suggests that the use of OTT (which stands for over-the-top) boxes, used to access Netflix and Hulu, are responsible for the drop. To date, the majority of what's available on Netflix and Hulu is pre-existing material. In other words, the production of this content was paid for under the existing TV model, where broadcasters pay a license fee and producers sell to multiple markets in order to finance their shows. But if the number of cable subscribers continues to drop, subscription fees and advertising revenues will also drop, making it even more difficult to finance original programming. TV's evolution from a business standpoint has been very interesting. Initially, when there were limited choices over the air, every program got a substantial audience. A show didn't have to be the best, it only had to be the best in it's time slot, and the competition was less than half a dozen shows. Everything had a sizable audience, which meant that everything was able to attract solid advertising revenue. Then came cable and the 500 channel universe. With more choice, viewership for individual shows fell. That meant less advertising revenue and budgets were reduced as a result. That's where reality programming came from, whether it was Survivor or the Home and Garden channel. Cheap programming became the standard instead of the exception. Now, with OTT, the ground has shifted again. In a 500 channel universe, competition was still somewhat limited. A show was still competing against everything on in the same time slot, there were just a lot more shows. OTT is built on the idea of on-demand programming, which means that a show is now competing against everything on at the moment and everything in the libraries of OTT service. And if people continue to dump cable, then newer shows are cut off from that revenue stream. The trend has been towards a continuing fragmenting of the audience into smaller and smaller chunks for each show. We could theoretically reach a point where a show is competing against every show ever made as well as every movie ever made. As the audience for each show gets smaller, how do you finance a show? Lower budgets are not the answer if you're competing against past product made with good budgets. This is especially true for animation, as older shows date less badly than live action and children are less sensitive to when a show was made anyway. I'm very glad that I'm not depending on the TV market for my livelihood anymore, and I wonder how aggressive TV animation studios are at finding new revenue streams. Budgets have been shrinking for years and will continue to shrink. Even The Simpsons is being done for less money (since 1991, viewership is down by 66%). At what point does the creation of animated TV become unsustainable? And what replaces it? Update: Jerry Beck, who will be co-hosting with TCM's Robert Osborne, has more details at Cartoon Brew. 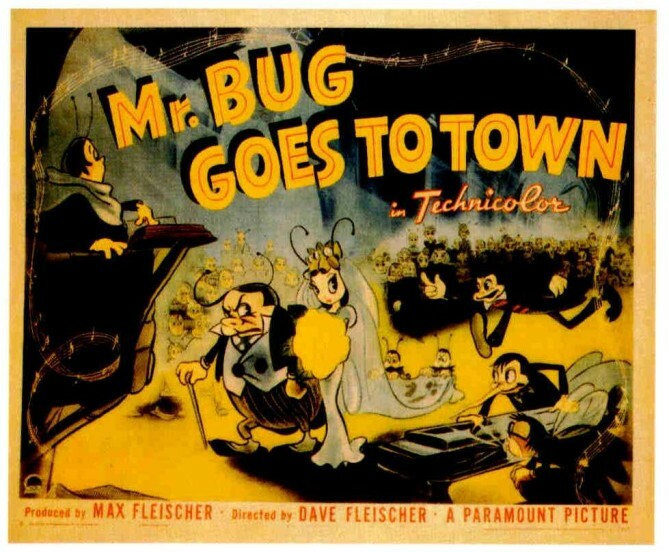 Sunday, October 21 is still a distance away, but Turner Classic Movies will be devoting their evening block to animation. It starts with the two Fleischer features, Gulliver's Travels and Mr. Bug Goes to Town. That's followed by six UPA cartoons (all available on the Jolly Frolics DVD set). Sundays at midnight, TCM regularly schedules silent films, and for this day they're showing 11 silent cartoons, including The Artist's Dream (an early J.R. Bray), Trip to Mars (with Koko the Clown), Bobby Bumps Goes to School, and Fireman Save My Child (with Mutt and Jeff). The next slot is for foreign films, and their animated example is Lotte Reineger's The Adventures of Prince Achmed. The schedule can be accessed here, and I'll be reminding everyone as the date approaches.